It was a big weekend for dog bites in sports. First, an Italian rugby player was bitten on the nose by a dog and may miss his team's next game. Then, a Brazilian soccer player was bitten by a police dog during a match. In a game between Democrata and Tupi on Sunday, Democrata striker Joao Paulo was bitten by a police dog when he went to retrieve a ball on the sidelines, according to the Associated Press. The dog was on a leash, but still managed to jump up and grab a hold of Paulo's arm. 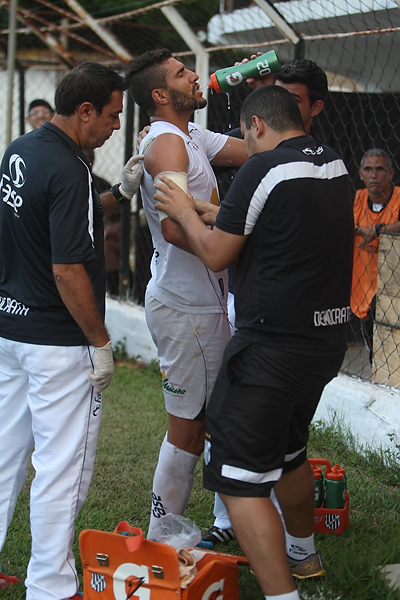 Paulo was bandaged up and returned to the field, but was taken to a hospital after the game to get an anti-rabies shot. To add insult to injury, Democrata lost, 1-0.